Nothing beats the classic food pairing, chicken and pesto. Chicken and pesto go together perfectly. Toss these two flavors together for a hearty salad. 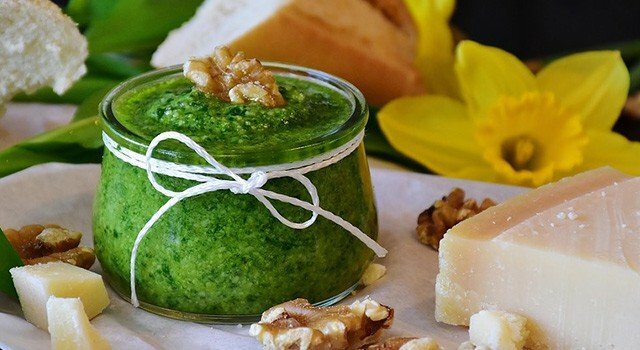 Pesto sauce can give a flavor boost to roast chicken, baked fish, and even soups! Heat pesto and garlic in a small saucepan over low heat until garlic is heated through. Remove from heat, and stir in cream. Season to taste with salt and pepper. Cool. Heat oil in a frying pan over medium heat. Season chicken with salt, pepper, and Italian seasoning. Fry, covered, until cooked through on both sides. Remove from pan, and set aside to rest 5 minutes. Chop. Arrange lettuce, onion, apples, tomatoes, walnuts, and cranberries among four bowls. Top salad with chopped chicken. Serve pesto cream dressing on the side.